Filmation impresario Lou Scheimer was born Oct. 19, 1928. Dig this birthday salute! Picking 13 episodes inevitably means leaving out some “gems” but worry not: I assure you, even if specific entries don’t make this list, I really dug the Atom and Hawkman cartoons and have a soft spot for the Superboy installments. Only the Justice League eps kind of bore me on the whole. The list I came up with is done with all due love and respect. There are some truly fun cartoons on this list — and ones that are fun simply because, well, they’re fun to make fun of. Lou Scheimer died in 2013, two days before he would have turned 85. 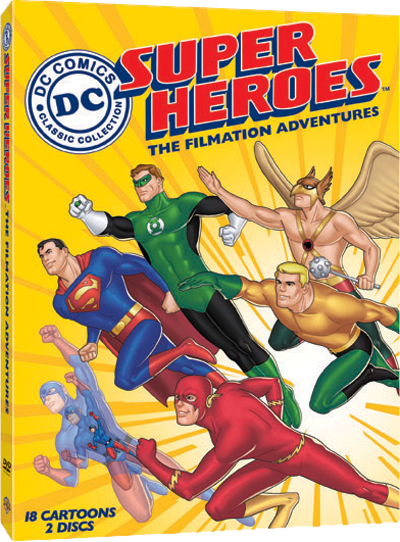 I, for one, am glad we can now enjoy the entire Filmation ’60s DC slate on disk or online. 2. The Flash: Take a Giant Step. 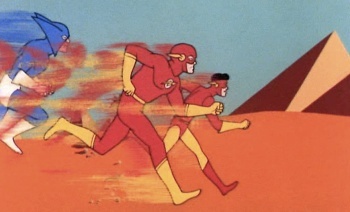 The Scarlet Speedster is practically unhinged in this one, as he barks “Decoy tactics! !” to Kid Flash and yelps that they should attack evil-scientist Kragg and “bowl him over with those ROCKS!” Kragg also entertains us by menacing fair-goers by waggling a giant pole, which looks as prurient as it sounds. Bonus: Flash and Kid Flash rub Kragg’s nose in his failure and taunt him mercilessly while the evil scientist stews behind bars. 3. Batman: How Many Herrings in a Wheelbarrow? 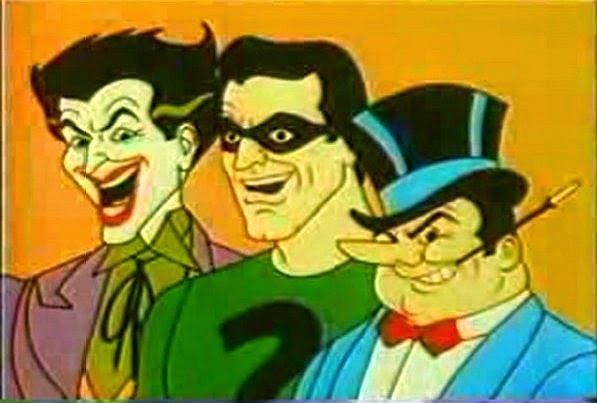 I never realized until I saw the Batman cartoons as an adult that it was the Joker’s and Riddler’s voices I used for my Megos when I was a kid. That doesn’t really have anything to do with anything. I just thought I’d mention it. This episode stands out for having probably the best death trap of the entire Bat-series. It’s worthy of the 1966 Adam West show. 5. Aquaman: All of them. I know I’m cheating but I really do find all the Aquaman episodes to be pretty interchangeable. And I don’t mean that in a bad way. Having Aquaman on TV in the background is like the low, warm hum of a fish tank with little men fighting each other inside it. 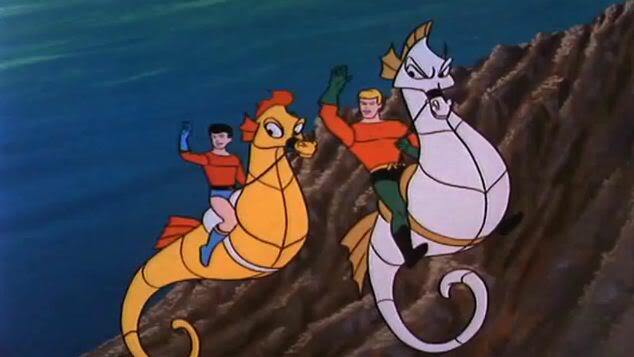 There is that episode where Aquaman and Aqualad ride away on their sea horses and make Mera swim home. That is so uncool. 6. Batman: From Catwoman With Love. Man, I dislike the Filmation Catwoman (at least the ’60s one). That voice is so screechy is runs completely counter to the idea of Catwoman’s appeal. But maybe they just figured it was easy to make her witchy for a kids’ show. Whatever. This one has a great opening with Batman and Robin disposing of a bunch of booby-trapped Valentine’s “gifts” linked to their various villains. Eventually, they adopt a cat — but it turns out the kitty was irradiated so that Catwoman could keep tabs on them. 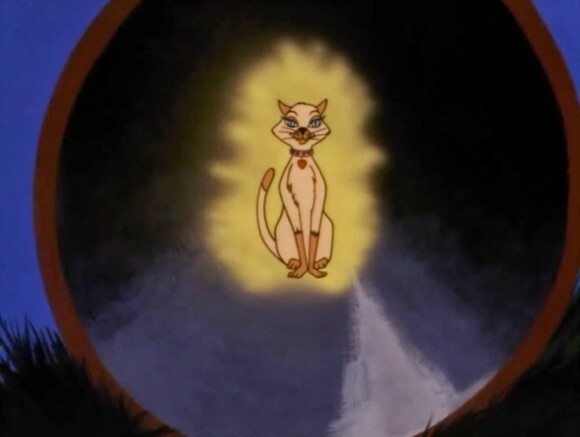 Even though the cat freaked me out as a kid — especially in that tunnel, when it was all glowy — I dug the whole Catmobile/Batmobile showdown. 7. Teen Titans: Operation Rescue. The Teen Titans are great because of all the DC superhero cartoons, these probably most closely approximate what the comics were like at the time, down to the “hip” lingo and patter. The three are more or less the same, but I’m picking Operation Rescue because it’s a rip-off/homage/satire of Jonny Quest. 10. Green Lantern: Evil is as Evil Does. Simply because we get an actual comics villain in one of the cartoons not featuring Batman, Superman or Aquaman. 11. Batman: The Jigsaw Jeopardy. This one just defies logic at every turn. Batgirl dresses herself as Robin for no apparent reason. Robin’s fingers sprout extra joints so he can “walk” with them and escape a death trap. A suspicious Batgirl figures out that the Drilred puzzle factory is a Riddler front and claims she “always wondered about that name.” Worst of all? The episode has more false endings than The Return of the King. 12. Superman: The Tree Man of Arbora. A similar conceit as The Iron Eater, or half the episodes of Star Trek: Misunderstood alien wreaks havoc until Superman sets it right by returning it home where it can drink all the water it wants. At least this time, Supes lets the Tree Man have some company. Best part? When the Tree Man empties the water tower down his throat and tosses it away in disgust when it’s empty. 13. Superman: The Mermen of Emor. Clark and Jimmy go on vacation together in Rome (!) but Jimmy ignores Clark’s safety warnings and ends up in the undersea world of Emor. (That’s Rome, backwards, get it?) Superman rescues everyone but not without getting in Jimmy’s grill about “failing to heed a warning.” There was probably some awkward gelato eating after that. — The Wonderfully Cheesy World of Filmation’s JUSTICE LEAGUE. Click here. I could spend a long time on the voice work of these cartoons. 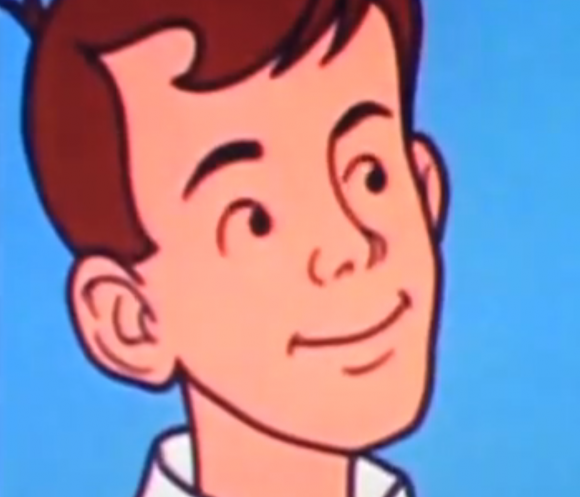 I have a real soft spot for the Superman cartoons because Jackson Beck who did the voice of Brutus on the Popeye cartoons was the narrator and he was Perry White. 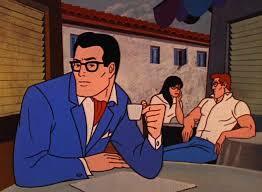 I also have a soft spot for the Batman cartoons – 1. Because of the cool theme song, and 2. Because Ted Knight did most of the voices, including the Riddler, Penguin and Joker you spoke of. I think Larry (F Troop) Storch did the voice for the Joker. Actually, Lou Scheimer disputed that in print and said that was wrong. That was all Ted Knight. I think his Joker just sounded like something Larry Storch would do. 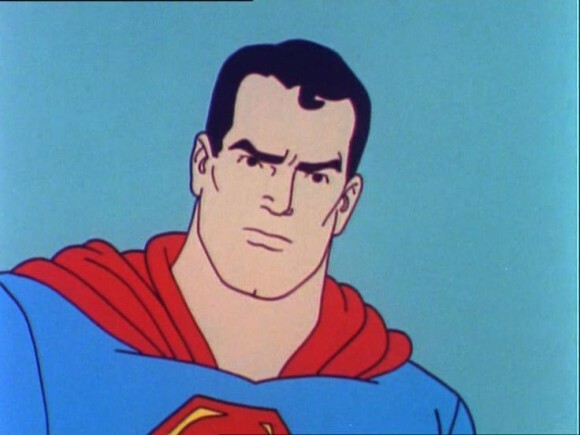 My favorite Filmation/DC cartoons are all Superman-related. 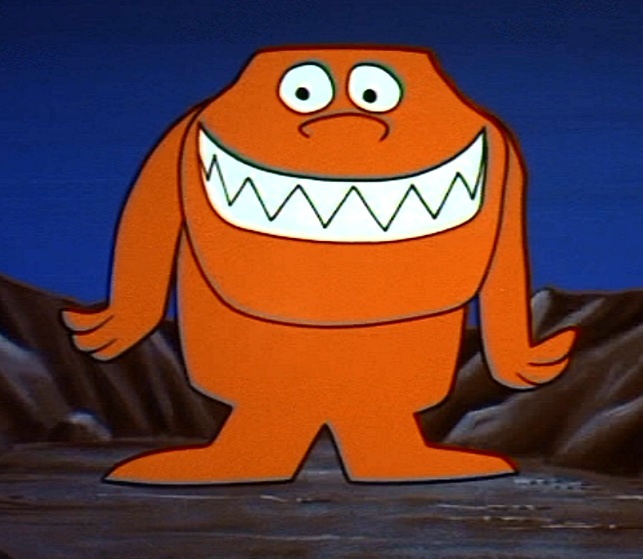 First there’s the episode that features an adaptation of the origin of the Parasite. There’s also the episode with Mr. Mist (I think that was his name) a vaporous being that could drift into an empty set of clothes and become a physical duplicate of the clothing’s owner. (This adventure struck my young self as particularly eerie.) Finally, there was Superman’s initial encounter with the Warlock, where Supes had to figure out how to beat a villain who could escape via teleportation. Fun memories. Beanie Martin is from the Radio series. 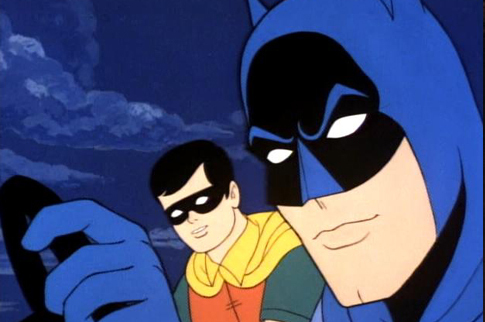 Personally, I love the New Adventures of Batman series from 1977. But then again I was 5 years old when it aired and it was my first exposure to Batman. While you choose not to include it with the Silver Age DC lineup, there are elements of the 77 series that were good, like Catwoman’s voice was sexier as opposed to screechy. Commissioner Gordon looked more comics accurate and having Adam West and Burt Ward in the series. 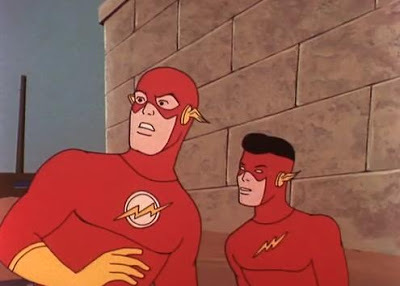 But I love both Batman tons by Filmation as well as Superman and Aquaman as well. You are so right on about Catwoman. And the heart wants what the heart wants: Everyone’s favorite Batman is their first. The theme song to the Batman cartoon always got me running to the other room when I heard it as a kid. It started my life long observance and love for the, sadly dying art, of the theme song. I love how all the Joker’s henchman look like him as if he’d made them get plastic surgery like Liberace had his aquaintances do. 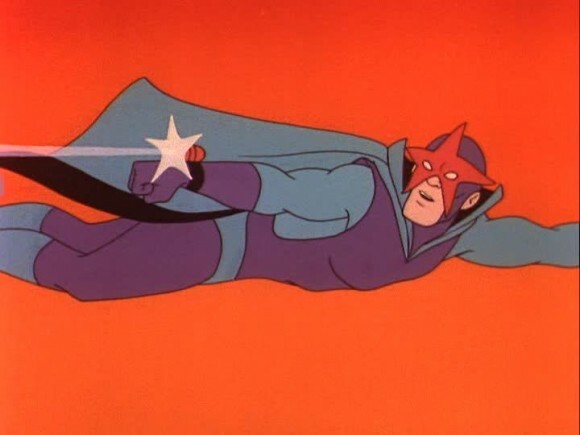 The JLA “Target Earth” stands out as having some of the best action with some superb animation direction and camera work by co-director Anatole Kirsanoff. Superman’s Night of the Octopod is also a favorite which seems to have more animation than normal. 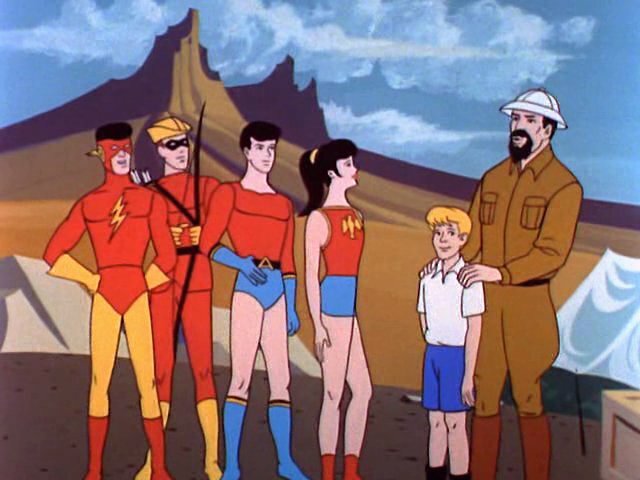 The Spy From Outer Space Part 1 & 2 is a great Superboy cartoon as well as Krypto, Super Seeing-Eye Dog which for a kid’s cartoon has some very real and serious moments. And while Aquaman was cut out of the JLA cartoons, The Sea-Snares Of Captain Sly is the only cartoon from the series to feature a JLA villain from the comic books, Starro! Happy birthday to the late Mr. Scheimer! Great toons! Always loved the Superman Aquaman Hour of Adventure opening theme. The super Super Heroes! !